Teachers are invited to experience the TLA Annual Conference to learn more about the value of teacher/librarian collaboration. 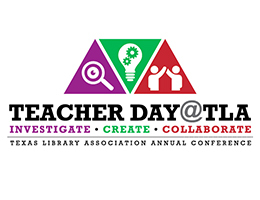 Teacher Day @ TLA gives classroom teachers the opportunity to strengthen collaboration with their librarians through specially designed conference sessions, guest speakers, and other engaging activities during a one-day special event at the TLA conference. Teacher registration includes full-conference registration so that teachers may attend multiple days, and a one-year TLA membership. Increasing Student Achievement through Effective School Library Programs, April 16, 2019, Austin Convention Center. Librarians are encouraged to recommend their school administrators and trustees attend this valuable conference where administrators will hear hear from expert speakers addressing the important connections between effective school library programs and student achievement. Held as an invitation-only event within the Texas Library Association annual conference, the TLA School Administrators Conference provides an opportunity for superintendents, principals, directors, and academic deans to learn about the important connections between effective school library programs and student success. Woven throughout the conference are opportunities for open dialogue with other educators to guide implementation of explored approaches at the local level.